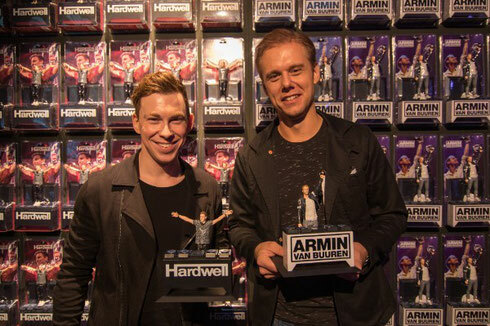 Hardwell and Armin van Buuren recently received the first copies of their own action figures. Dutch stand-up comedian (and friend of Hardwell) Guido Weijers handed over the first few figurines to the musicians. Even though major international stars such as Michael Jackson, Elvis Presley, Kiss, and The Beatles have been immortalised this way before, Hardwell and Armin van Buuren are apparently the first DJs to have received their own action figures. The action figures have been created through the use of the latest 3D scanning and printing technology. With a hi-tech multi camera setup, the artists have been scanned and 3D printed. Next to the action figures, the official music video for ‘Off The Hook’ was launched too. The collaboration between Hardwell and Armin van Buuren was released as a single at the beginning of September and the track is also featured on ‘Embrace’, Armin’s latest and sixth studio album. The music video is completely animated. Armin van Buuren is is one of the world’s most prominent DJs and was elected as the world’s number one DJ five times. Last month, he dropped his sixth artist album ´Embrace’, which features collaborations with several artists including Jazz trumpeter Eric Vloeimans, singer-songwriters Cimo Fränkel and Mr. Probz, rock band Kensington, Hardwell, Cosmic Gate, and Gavin DeGraw. Next year, Armin will launch his brand new ‘Armin Only’ tour, based on his new album. His last world tour, ‘Armin Only Intense’, apparently drew in over half a million visitors to more than 30 locations, spanning a grand total of five continents. DJ and producer Hardwell, also known as Robbert van de Corput, was crowned the #1 DJ of the world in 2013 and 2014. In March this year, he received five ‘International Dance Music Awards’ (IDMAs) at Ultra Music Festival in Miami earlier this year, also announcing the launch of his United We Are Foundation to help underprivileged children in India through education across a five-year programme, raising €50,000 for the cause at his recent sell-out IAH Germany arena show, that saw 40,000 attendees make history. In January 2015, he released ‘United We Are’ as his first artist album, which reached the #1 chart position in over 20 countries worldwide. On 4 December the remix version ‘United we Are-Remixed’ will be launched. Hardwell is still touring the world with his ‘United We Are’ concert tour. On 7 November, he gave his biggest solo show so far when he played at the sold-out Veltins Arena in Gelsenkirchen (Germany) in front of 40,000 excited fans.